Release Date: August 11th, 2006 by Columbia Pictures. The Cast: Tim Allen, Courtney Cox, Chevy Chase, Spencer Breslin, Kevin Zegers, Kate Mara, Michael Cassidy, Randy Newman, Rip Torn, Cornelia Guest. BASIC PREMISE: Jack (Allen) prepares a small team of young superheroes for a secret mission at an Academy. who can enlarge any part of his body during combat—thankfully this movie’s only rated PG. None of these young superheroes are particularly memorable or interesting. Essentially, Zoom is one long first act with too many training sequences, a brief second act, and a third act that, finally, kicks off the plot into the action genre. Co-screenwriters Adam Rifkin and David Berenbaum include too much silly, unimaginative humor which quickly falls flat because it seems too forced and juvenile. Trying to solve the secret mission’s secret, which Jack doesn’t know about, is a no-brainer. Usually, there's an actor with great comic timing who can save the movie from being painfully unfunny, but, in this case, not even goofy Chevy Chase can help. Even the bloopers at the end don’t add much of anything. The special effects are not really that special or as thrilling as they should have been. On a positive note, At least this movie is slightly more entertaining than Santa Claus Conquers the Martians. 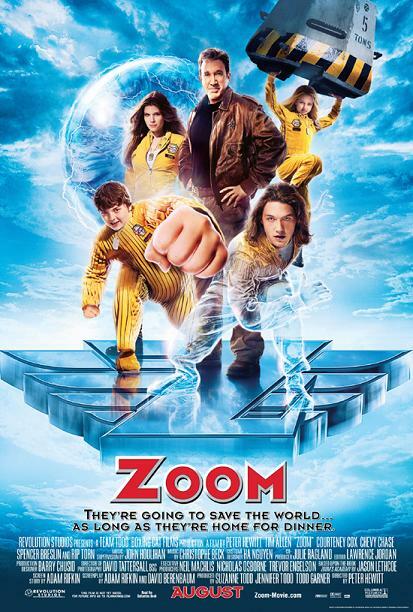 Zoom will quickly zoom out of your mind at a brief running time of 88 minutes. IN A NUTSHELL: Cheesy, dull and unimaginative.